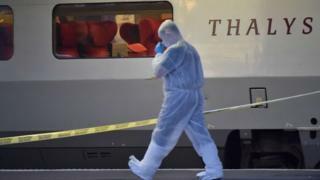 A British man caught up in the foiled train attack near Arras in northern France has criticised the actions of the train's staff. Jamie Robinson, a medical researcher, told the BBC's World Have Your Say programme that passengers were abandoned by the staff, who ran and locked themselves away in a service room. His experience tallies with that of French actor Jean-Hugues Anglade, who described being backed up against the metal door, and getting no response to passengers' desperate calls for help. The drama unfolded on board a high-speed train travelling from Amsterdam to Paris on Friday. Mr Robinson realised something was wrong shortly after the Thalys train went through Brussels. He saw three members of the train's staff run through his coach, carriage 11, which was the next compartment along from carriage 12, where the gunman emerged. "They said nothing. They were a man followed by two women," he says. "They looked scared, they didn't alert us to anything, they ran to the end of my carriage and used their key to open a service door. Then they locked the door after them." Carriage 11 was in the front half of the train and the locked door allowed staff access to a service area, which was off limits to passengers. Then other people started running through from carriage 12. Some were covered in blood, others said they had seen a man with a gun shooting people. "There we were, with nowhere to go. There were probably 20 to 30 of of us, including the French actor Jean-Hugues Anglade and his family. We didn't know anything." Image caption French actor Jean-Hugues Anglade, who was on board, said: "I thought it was the end"
Anglade, who injured his hand as he tried to activate the train's alarm, has also spoken about members of train staff locking themselves in a private cabin, complaining that they could have led passengers to a luggage area in another part of the train. He told Paris Match (in French) "We shouted for the staff to let us in, we yelled 'open!' There was no response." Agnes Ogier, the boss of Thalys, has said there will be an internal investigation and the staff involved will be asked to "explain their behaviour during this dramatic event". Jamie Robinson says after 10 terrifying minutes a man entered their carriage and explained there had been a man with a gun but the situation was now under control. Afterwards he learned this was Anthony Sadler, one of the American passengers who helped overpower the attacker. "The relief just exploded. We were all in such painful shock," he recalls. After learning they were safe Jamie Robinson and other passengers in his coach remained where they were, in numb silence, until they reached Arras station where the suspect, Ayoub El-Khazzani, a 25-year-old Moroccan, was arrested. Four days on from the traumatic events, Mr Robinson still can't understand why the train staff did nothing to help the passengers. He even believes the three staff may have jumped off the train as it slowly moved into Arras station. "They must have some responsibility, not to attack the attacker but some training to alert passengers. There was nothing. They got out, they saved themselves. They locked us in that compartment." Image caption Mr Hollande (C) said of Chris Norman, Anthony Sadler, Spencer Stone and Alek Skarlatos: "You gave us a lesson in courage"
He says he will never be able to forget the heroic actions of those who tackled the gunman. "My life was in their hands. Whether they think it's heroic or not, they have helped so many people and we are forever indebted. It's a phenomenal reaction and action that they have had." Three Americans - Spencer Stone, Alek Skarlatos, Anthony Sadler - and Briton Chris Norman were presented with the Legion d'honneur at the Elysee Palace by President Francois Hollande. Two other passengers, US-born French national Mark Moogalian and an unidentified Frenchman, will receive the honour at a later date.